Your pampas grass will tell you when it is time to divide it. When you begin to see areas in the center of the grass clump that lack new growth, this indicates that the center of the clump has an excess of old growth that is preventing new growth from filling in. 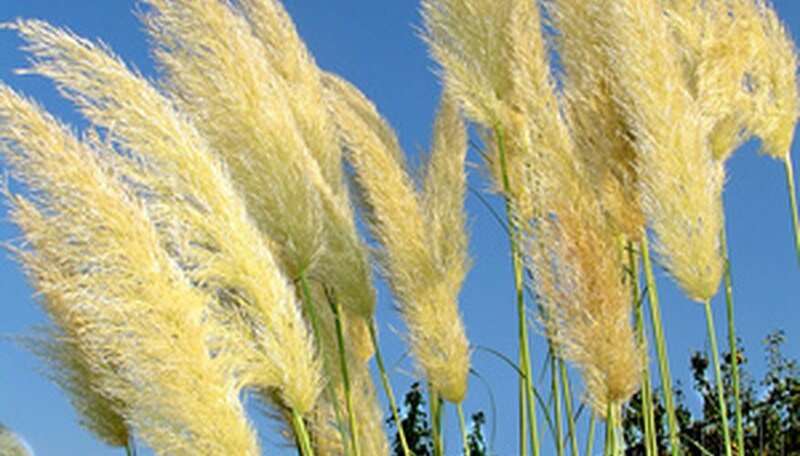 Help renew pampas grass by dividing it in the spring before the growing season begins. Spread the tarp near the pampas grass. Cut back all pampas grass foliage to approximately 4 inches above the soil level with the grass clippers. Discard the foliage. Dig the pampas grass clump from the soil with the shovel. Take care not to damage the roots as you dig it up. Place the clump onto the tarp. Situate the clump on the tarp so the crown of the clump faces up. Insert both the shovel and the garden spade into the top of the clump at the center point. Position the two tools so they face away from each other and you can pry them apart with leverage. Push the shovel and spade away from each other to divide the clump into two halves. Divide the two halves into half again using the same method so you have quarters. Examine the quarters carefully. If you see dead areas (from the center of the clump) cut these away with the utility knife. Remove any areas that appear unhealthy and discard these to your compost bin. Replant the new pampas grass clumps in a sunny location. Space the clumps at least 4 to 5 feet away from any other plants. Place the clumps in the soil at the same depth as they were previously growing. Provide a generous amount of water immediately after replanting the pampas grass. You might choose to divide the pampas grass into even smaller sections if you want more pampas grass to plant around your landscape. As long as sections have at least one stalk of grass and two to three roots, they should grow. Wear gardening gloves, long pants and long sleeves as you tackle your pampas grass. The foliage of this ornamental grass easily irritates and may cut skin.